All this week we've been taking you behind the scenes at Novelicious with guest posts from Team Novelicious. Finally, we hear from our dynamic editor Kerry McKay. I started lurking around these Novelicious parts years ago. It was always such a wonderfully chipper and madly addictive site full of awesome bookish news and reviews. What wasn’t to like? The team behind it were so unashamedly nerdy when it came to all things literary, too – my type of folk, I reckoned. In 2013, when I read that Novelicious was starting its own imprint, I thought I’d try my luck and offer my services as a publicity type person. My subject line read: A Very Hopeful Email. I was hopeful. What an awesome job that would be, I thought. Working alongside the fabulously talented Kirsty Greenwood and Co while promoting beautiful and hilarious books. Lo, Kirsty replied! We emailed back and forth for a while before I was welcomed into the lovely team that is Novelicious. I was thrilled! Over time, my role as a publicist grew to that of an editor of the site. Needless to say, I love starting work every morning and getting to dedicate a chunk of my day to promoting women writers and their work. No birthday could possibly be complete without presents – it’s, like, the law. So, to celebrate five years of Novelicious, we have some seriously amazing prizes to gift to our very favourite people in the world (YOU GUYS) every single day this week! Be sure to check back often – giveaways will be posted several times a day and you won't want to miss out on any of these bad boys. The Literary Gift Company is a veritable playground for book nerds like us. It boasts a massive range of products from cheeky grammar mugs and repurposed book handbags to quotable chocolate bars, clever shelving and literary clothes. Today we have a gorgeous goody bag stuffed with bookish treats galore for you to win! Win – A Whole YEAR'S Supply of Books! We’re coming to the end of a fantastic week of birthday excitement, but we still have a few awesome prizes to gift to you before celebrations come to a close. And today's prize is a big 'un. A whopping year’s supply of books! You read that right. A whole year. Full of gorgeous books! For you! It’s what dreams are made of. We Heart Bloggers. Big Time. A Guest Post by Senior Commissioning Editor Caroline Hogg. 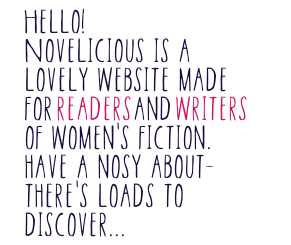 It’s pretty hard for me not to gush about Novelicious; for as long as I’ve been an editor of women’s fiction, they’ve been championing the genre in a way that’s genuine and professional and downright funny. And Novelicious editor Kirsty happens to be one of my authors too here at Macmillan, so colour me super biased. But the whole book blogging community is a thing of beauty that we publishing types get very excited about. You might think, ‘Of course you do, they talk about your books and spread the word on your behalf.’ And you’d be right, but there is also much more to it than that. We start talking about and working on a book inhouse sometimes more than a year before its publication: we obsess over the editing, the layout, the title and shoutline, the cover design, the publicity campaign, the marketing plans, how many copies we’ll get into the shops… And all within our publishing bubble. We’re using our best ideas, skills and experience to get the job done to the highest standards but it isn’t until the book makes its way into the hands of early readers – the bloggers among them – that we really know whether we’ve got it right. All this week we'll be taking you behind the scenes at Novelicious with guest posts from Team Novelicious. Today, we hear from founder and editor-in-chief of Novelicious Kirsty Greenwood. I've never stuck to much of anything before; for the early part of my twenties I flitted from one thing to another, never quite knowing what I was supposed to do with my life. And then, after my boyfriend Edd bought me an internet connection for my birthday, I decided to start a blog called Novelicious in which I would write about the books I'd been reading that week. Since then my whole life has changed. I found the thing that makes me properly, heart-glowingly happy - writing stories, thinking about other people's stories, sharing stories and helping budding authors to write their own stories. Spending most of my time blogging about books and learning everything I could from my favourite authors led to me writing my own book, getting an agent and, eventually, a book deal with Pan Macmillan. Since the wonderful Kerry took over as Editor and I've been writing my books, my role at Novelicious has become more of an overseeing one. I help Kerry to come up with new feature ideas and have final say on the content, tone, design and direction of the site. My tasks really vary: one week I can be working on opportunities to expand our audience and grow our subscriber lists, the next I'll be tweaking the site design, interacting with followers on social media or answering emails from publishers, authors, team members or readers of the site. For me, the best part of being at Novelicious is Team Novelicious. From gossiping on our secret Facebook group page to encouraging and celebrating each other's writing journeys, we have such a lovely time together. They are all clever, passionate, kind and vibrant individuals. That I get to work with them makes me feel good about the world and I now count some of these women amongst my closest friends. We’d pick a fictional party over a real one any day. For one thing, fictional parties are much easier to organise. You don’t need to set up any Facebook groups, buy any booze or put up any fairy lights. And for another, you’ve got total control over how they pan out. Our debut novel, Lobsters – a dual narrative YA book about two teenagers trying to lose their virginity and find love before university – is bookended by two parties; one to celebrate the end of A levels, and one to coincide with A level results. Neither exactly goes to plan. Girls get vomited on by boys they fancy, boys get christened ‘Toilet Boy’ by girls they fancy, and some people end up eating up dog treats out of Tupperware containers. And that’s just the tip of the iceberg. It ends spectacularly badly (we won't spoil it if you haven't read it), but for the most part, this illicit shindig at an Oregon mental institution is an absolute hoot. Cheerfully shattering every rule put in place by the terrifying Nurse Ratched, flame-haired rebel McMurphy waits till after dark before smuggling wine and women into the asylum, so the inmates can dance, drink, and "laugh till we were rolling about the couches and chairs, choking and teary-eyed." Which makes a welcome change from their usual, incredibly bleak, existence. It doesn’t seem fair to reduce the Triwizard Tournament’s ‘Yule Ball’ to school disco status, but that’s essentially what it is. There’s the stress of who to ask (Harry gets rejected by the enigmatic Cho in favour of his annoyingly good looking rival Cedric, Ron fancies the pants off Hermione but can’t summon the courage to ask her), plus the classic teenage fretting over what to wear and how to retain a shred of dignity while dancing in front of all your mates. The decorations, music and food make it objectively one of the finest literary parties ever thrown, but of course, it ends up with almost all Rowling’s protagonists sobbing or scowling by the end of the night. Book Bloggers Unite – Why Do We Blog? As fun and fulfilling as maintaining a website dedicated to all things literary is (we get to talk about books all day long – what's not to love? ), it takes a lot of hard work, organisation and pure, unadulterated passion, too. In honour of our 5th birthday, we decided to gather a few of our favourite book blogging pals for a virtual tea party, to talk about why we do what we do and how much we love it. Do you have a book blog? Be sure to share your link in the comments so we can check you out! We book blog because we're sincerely hoping to promote great books to avid readers looking for something new! Book blogging has become so much part of our lives that we couldn't imagine a day without it – so we keep cramming in into our busy schedules (like most readers, we sneak a few minutes here and there for a good book) and get a big thrill when we know we've connected an author with a new fan. Congratulations on five years Novelicious! I like to blog about to books because it's my passion and it's so much fun, sharing good books with other readers. I love how I get to be a part of the blogging community as well as the writer sphere on Twitter and other social media sites. I really love it when I get to brighten an author's day by telling them how much I enjoyed his or her book. I guess blogging about books is my escape? It's my baby, my blog, because I started it from scratch and I poured all my heart and effort into moulding it to what it is today, building a readership and getting my blog out there. What I'm saying is, blogging has become a part of me. All this week we'll be taking you behind the scenes at Novelicious with guest posts from Team Novelicious. It's time to hear we hear from our fantastic reviewer Kelly. All this week we'll be taking you behind the scenes at Novelicious with guest posts from Team Novelicious. This fine morning, we hear from our hilarious contributor Cesca Major. Well my workspace slightly sums up my Novelicious contributions. I wrote reviews and blog posts for a couple of years all over my house (bed, sofa, desk, kitchen worktop etc.) and was lucky enough to be invited to some fantastic events (highlights have included running around The Melissa Nathan Awards with a Novelicious banner, being snapped with incredible people, lunch at the Ivy with one of my girl crushes Joanna Rees, cocktails with author Melissa Hill and a Meet the Author panel at Simon & Schuster with Ali Harris and Wendy Wallace - very different writers but both completely fantastic in their fields). On top of the fun and the glamour I also got to read such a wide variety of books and contributed regularly to 'Alternative Thursday' with books from favourites: Natasha Solomons, Hannah Richell, Kerry Hudson, Charity Norman and more. Then I started filming bi-weekly vlogs for the site - I was writing in earnest and wanted to share the things I was learning along the way. These were brilliant fun and I loved handing on information that I had picked up. Look at all of those books! Aren’t they pretty? To be in with a chance to win one of five gorgeous book bundles from our friends at Books and the City, featuring some of their top authors, have a look at the simple ways you can enter below. I’ve been writing my column, Secret Dreamworld of an Aspiring Author, for Novelicious for four years now. I don’t what amazes me more, that I still think of something to write every week or that people still read my rambles. I got my Novelicious big break when I saw that their aspiring author columnist had quit because she had decided to change her allegiance from chick lit to crime fiction. It was late at night and I’d had a wine, and I sent Kirsty an email to see whether I could take over the column. She said yes, and after a couple of test columns I was in. The column itself has changed over the years, reflecting my writing journey. When I started writing it, I’d written one manuscript and had a large number of rejections from agents, the nicest of which had told me my writing had no sparkle. The column has seen me through thick and thin, from self-publishing my books to when I got my agent and then my three book traditional publishing deal. It now focuses on what it’s like to be a hybrid author doing both self-publishing both and with a publisher. This week, as part of our birthday celebrations, I thought the cake in question should be, rather fittingly, a birthday cake. A simple but tasty birthday cake, which says not just thank you to Kirsty and Novelicious for enhancing our fiction reading pleasure. (And I think you might agree this calls for a massive THANK YOU). But additionally, it's something of a thank you to all authors out there who have provided a fabulous wealth of material for us to write about and, in my case, to recreate aspects of said novels in my own cake-bakery-kind-of-way as a (hopefully) fitting tribute. It has been a delicious pleasure. Finding food mentioned in a novel is always an absolute joy. (Though I may make an exception for this book). One of my most favourite authors, J.K. Rowling, once said that the author Elizabeth Goudge “always described exactly what the children were eating, and I really liked knowing what they had in their sandwiches”. I, too, love to know what's in their sandwiches, what type of coffee they're drinking, what flavour cake they are eating. Mention a biscuit and I need to know whether it is chocolate chip or a plain digestive. Adding that extra detail is exciting and immediately means you can taste it, too. You know just what flavours that character is feasting on at that point in the novel. So thank you. Thank you to Freya North, to Marian Keyes, Carole Matthews, J.K. Rowling, Lisa Jewell, Jojo Moyes, Adele Parks, Jennifer Weiner, Rowan Coleman, Julie Cohen, Judy Blume, Enid Blyton, Agatha Christie, Kate Harrison, Lucy Diamond, Sophie Kinsella, Jo Rees, Kirsty Greenwood and many, many more – oh so many – wonderful authors, for adding that extra flavoursome layer to the story and allowing us, the reader, to be right there in the novel with the characters. Have a slice of cake, why don't you? Is your to-be-read pile toppling over? Are you in dire need of some R&R and a solid couple of days to catch up on your reading list? Yes? Step right this way, book nerds. Today, we have a spa break for two at any Shire Hotels property to give away! The Top 21 Novelicious Posts EVER. We've been having a good old shuffle through the archives for our favourite Novelicious posts of all time. Without ado, here they are! This epic two-part interview in conducted in July 2012 is one of our favourite interviews to date. Jane and our interviewer Amanda Keats got on like a house on fire! Another two part post written by our editor Kerry Hiatt. This post had the whole team in absolute stitches. Our Cesca Major went to a book launch for a fantastic book called The Middle Class ABC and happened to bump into her crush HUGH LAURIE while she was there. When Cesca got home she re-enacted the interaction and filmed it for us. This series spanned 10 weeks and asked questions of 7 of the UK's top literary agents. This remains one of the site's most popular series to date! Check out that room! It had us green with envy.Other favourite writing rooms we've loved belong to Karen Swan, Lisa Dickenson, Daphne Kalotay, Charlotte Betts and Emylia Hall. A super popular series in which the fantastic Caroline Hogg, Senior Commissioning Editor at Pan Macmillan, answered reader questions. The best set of writiting tips we've been given in five years. Recommended reading for all writers. Novelicious Undiscovered was a wonderful experience where we got to showcase loads of amazing writers in a mega competition. Many of the top 20 shortlisted authors went on to get literary agents and publishing deals! One even became part of team Novelicious! A lady made some dolls that looked like authors. Simple as that, really. There was a collective 'Aaah' at Novelicious HQ when we read this because Joanna Rees' book deal moment is so intricately tied with how she met her husband. Other favourite Book Deal moments amongst the team include those of Alexandra Brown, Mary Fitzgerald and Lucy Atkins. We joined forces with author Sophie Tobin and Simon and Schuster to take an in-depth look at the publication journey of The Silversmith's Wife, from signing of the publishing contract all the way through to publication day! Anna's been writing her column here for four years. It's been fantastic to see her go from aspiring author to self published author to traditionally published author! Written by Kerry, this post in March this year went viral. A really great list of tools to help with all aspects of writing. Bookmark it for sure. Sarah Painter's weekly posts are a huge favourite with the Novelicious team. Join Sarah as she chats about how to write a novel and get it published. Carlie Lee had a lovely jolly about some of the UK's best indie bookshops and told us all about her experiences. Well, we had to include the post that started it all, didn't we? The story of how Novelicious editor-in-chief Kirsty Greenwood signed with an agent on the one year anniversary of Novelicious! She then went on to self publish before signing a traditional book deal with Pan Macmillan and with publishers in multiple countries. BAKED GOODS + BOOKS + HELEN REDFERN. 'Nuff said. Another fantastic Kerry Hiatt mega post, this one is a must-read for writers! We're huge fans of Cesca Major's bubbly and helpful writerly advice videos. Every book we've ever bestowed with a highly coveted 10/10 score. Must Reads. What have been your favourite Novelicious posts? What have missed off the list? Tell us in the comments!